For those nights when I have few vegetables in the refrigerator, and not a lot of time to cook something complicated, a stir-fry is usually the best thing to cook. I love how easy they are to throw together, and how something so incredibly simple can taste delicious and be good for you, too! This recipe was bookmarked (okay, Post-It noted) in my awesome Cooking Light cookbook for over a year, and I just never got around to making it. I’m glad that I finally did, as we both really enjoyed it. The best part is that it was easy, and was ready very, very quickly – a must when you leave work late, leave the gym late, and get home late! Heat a large skillet over medium-high heat. Add oil to pan & swirl to coat. Add pork and chili garlic sauce, followed by the ginger. Stir fry for two minutes, then add the bell pepper. After another 2 minutes, add the both, soy sauce, and peanut butter. Reduce the heat to low and cook until the sauce starts to thicken. Stir in the onions. Add the udon noodles and toss well to combine. 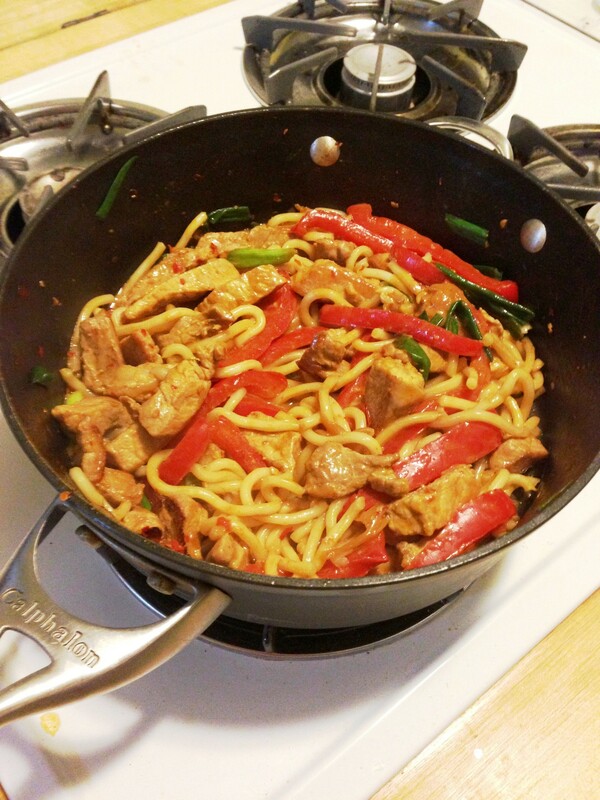 A quick stir-fry for a busy night! I’d say that from start to finish, this dinner took 30 minutes, tops! It was quick, easy, and tasted absolutely fantastic. At first I was a tad skeptical about adding peanut butter – of all things?! – to this dish, but it really took it to the next level. Trust me – don’t leave it out if you can help it. Mike & I recently discovered these precooked udon noodles at one of our grocery stores, and we can’t get enough of them in our stir-fry’s as of late. If you want, you can simply omit and serve with rice instead. I get Szechuan chicken all the time…glad to know I can also make it at home 🙂 I didn’t know there was usually peanut butter in it. YUM! I was surprised about the peanut butter too! Such an easy, delicious dish – and it’s not too unhealthy either 😉 Thanks for visiting!